FREE DEEP FRIED WONTON & 3 BEVERAGES WHEN YOU BUY 3 MAIN COURSES FOOD AT SECRET RECIPE! Ramadan festive is just around the corner. 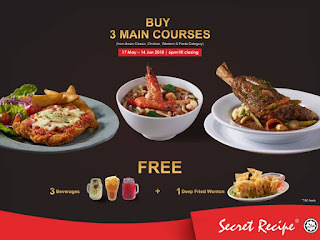 Secret Recipe is offering a dinner promotion from 6pm onwards where you can enjoy free 3 different beverages and 1 deep fried wonton if you buy 3 main courses. Let's have a blissful Iftar with a happy tummy!